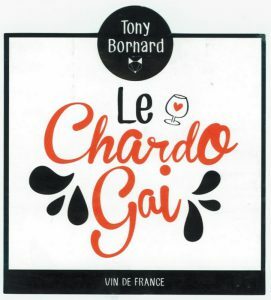 Tony Bornard has firmly established himself as an important producer of Jura wines given his track record over the past few years. His wines have been consistently delicious and well-received by consumers from New York to Tokyo to Australia. Tony started his career been working with his father, Philippe and then studying winemaking at University before spending time in broadening his winemaking experience in Australia. 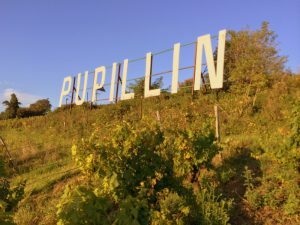 He then secured vines in one of the most iconic spots in the Jura, namely around the huge “Pupillin” sign in the centre of the Arbois-Pupillin appellation area. From these vines he is currently producing a single Chardonnay cuvee, a delicate Pinot Noir and a light red made from Ploussard (Pupillin is, after all, the world capital of Ploussard). The cute, eye-catching labels on these wines are designed by Tony’s talented sister, Charlene. 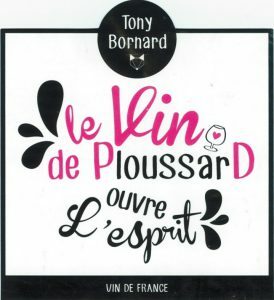 The Tony Bornard Ploussard is a light, juicy red wine that is perfect for drinking at almost any time of day. It is light in alcohol like many red wines from the Jura region, but it has the characteristic deep flavour derived from the complex marl soils that are a feature of this area. Tony thinks that drinking this wine will “open your mind” (ouvre L’esprit). This is a very interesting and exciting wine. We tasted Tony’s wines in Pupillin when we visited him in September last year. We loved the wines even though they were then very young. We therefore were waiting with some anticipation to see how they would be after another nine months in the bottle! After one sip of the Chardonnay we were delighted! This is a stunning, quaffable, exciting wine that we have now tried a number of times because we just can’t stop drinking it. We have tried it with a duck and pork cassoulet and we also tried it at Dark Mofo with Marty Boetz’s deeply-flavoured pork neck curry. It was perfect with both. It is also fresh and lively enough to be drunk as an aperitif. This is a very, very good wine from a winemaker with lots of experience in the trade. 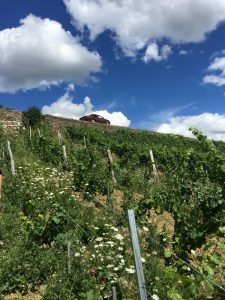 The 2016 vintage reflects the summer that they had in the Jura. It is always exciting to receive a Pinot Noir from the Jura, and even more exciting when it is supplied by Tony Bornard. It is useful to remember that Tony’s vineyards are only an hour’s drive from the centre of Burgundy, so it is not surprising that Pinot is grown here. It was brought up the road from Burgundy hundreds of years ago and has developed its own character with the different climate and the different soils and the different yeasts that are found in this region. This is a very supple wine with good fruit and some length. It is a perfect wine for roast lamb or roast chicken. 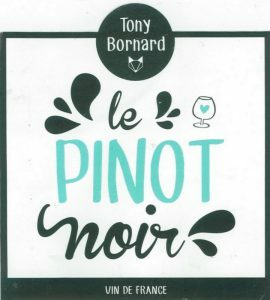 This is another Pinot Noir from Tony Bornard. 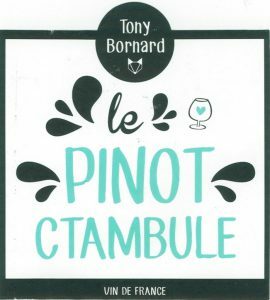 It is useful to remember that Tony’s vineyards are only an hour’s drive from the centre of Burgundy, so it is not surprising that Pinot is grown here. This is a more serious Pinot Noir than his early drinking Le Pinot Ctambule 2015, which we received last October and were showing at Rootstock 2016. The vines are about 25-30 years old growing in black and red marl in a parcel just near the famous Pupillin sign you can see as you drive along the N83 from Poligny to Arbois. During maceration Le Pinot had a little pigeage and pump-over so it is slightly more extracted than Le Pinot Ctambule. This wine was aged in a single 400 litre barrel and was bottled in June 2016.